This is an economic/invasion scenario. The economic side is the more crucial of the two. There are some hidden factors at play. So beware! MAKE SURE YOU PLAY ON THE NORMAL SETTING. I have provided several walkthroughs, in case the scenario becomes frustrating to you. Listen to the advice of the King’s minister, Lord Tarlach. “As you well know, my Lord, the King and his armies were cruelly defeated at the battle of Endless Tears. He and a few of His faithful subjects are now living unseen in the great forest near the Northern Mountains. This scenario is meant to be played on the normal setting. If you play on easy it might actually become more difficult. On the hard and very hard settings you can increase your population cap, but get ready for some nasty fighting. -	Everything hinges on the size of your population. You must determine what it should be, my liege. If it be too small, hostile forces will destroy you; too large and endless catastrophes will rain upon you. In the end, they too will destroy you. -	Use any means at hand to defend yourself, though they may scarcely be enough. -	Train your knights quickly: as many as you can! -	Carefully read the advice of the King’s minister. -	Or do as you will, but do not say you were not warned! -	Once you have survived the invasions, the economic goals set by the council are trivial. If you can't survive the initial invasions, read this! Muhaha! 1. Keep population at 24 no matter what. 3. When the enemy enters the map, call all your men into the fort; or the dogs will be distracted from their duty to kill the spearmen. 4. Release the dogs right on top of the spearmen. 5. 4 to 6 cages will usually do it. I build the cages mostly right by the gate, a few reserves on the sides. You can't afford to have the gate breached. 6. When the spearmen are dead I let my reemerging woodcutters and hunters (and pups) kill the war dogs (or wolves if any come onto the map). The hunters and their doggies will take some losses but will eventually kill all the dogs/wolves. 7. You have to do this two or three times, with some early invasions! hahaha! The minister told you! Your resources will scarcely be enough. There is no other way to survive. 8. Meanwhile you are mining iron and making knights which easily take care of the following enemy invasions. (dogs are your reserve) . You will need 30-35 knights to survive the last attack. 8. If population is above 24 you will be crippled by various blights. Initially, I just hunt and cut wood. One hops field and 4 or5 iron mines a bit later. Finally, a growing number of armorers and smiths. A wheat field and ONE bakery when the hunting game runs out. (easy does it) More notes accompanying maps. This scenario is meant to be downloaded from the Stronghold.Heavengames site only. If it appears anywhere else, please contact me at Elfraj@cox.net. I had not read the notes before to play to figure it out my way and I played slightly differently. 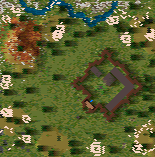 I did start with the hunters and woodcutters like mentioned, but I also reduced the stockpile from 8 to 4 tiles and deleted the gate and walls, which gave me an extra wood at the start. You can not build any walls or gates, so whenever a breach is made, you are in trouble. I figured I would have to do without it. My strategy to survive the invasions was the use of wooden traps, so soon in the game I surrounded the keep with it. Once I finaly managed to create a stripe of wooden traps to the side where the pole is, I found out that the hunters would not cross that stripe to go hunt the remaining deers that were located onto the other side of it. I deleted the hunters huts and ended up producing only bread. After the wooden traps protection was set, it became a little easier to have a good runing economy. But this strategy kept me in constant need of wood. I did not start producing weapons until later in the game as I based my defenses only on the wooden traps. I had no military unit. I did get a little worried during some attacks of wolves, but luckily, I managed to keep the Lord health bar at half until the end of the game. You will need subtlety in order to make it. Your objective, for more fun, is to acquire swords and metal shields... and Gold. Food is limited to meat and bread. The events are very well mixed, and the invasions choosen precisely. It's a delight. The restriction to the only available military unit being the knight; the well timed invasions and events; the choosen invading units; all of this together make this map very interesting. The terrain and available ressources fit well with the scenario and make this map captivating. I really enjoyed playing it, even it's a tiny sized one. Nice story, excellent instructions and hints. If you like challenges, this is one.